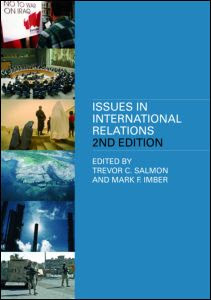 Issues in International Relations 2nd ed. is a clear and simple, but stimulating, introduction to the most significant issues within international relations in the 21st Century. Written by experienced teachers in a jargon-free way, it assumes no prior knowledge of the subject, and allows students approaching International Relations for the first time to gain confidence in what is an often complicated and confusing discipline. Completely revised throughout with the addition of ten new chapters, this textbook; introduces key conceptual issues, including theories of international relations, power, sovereignty and globalisation considers contemporary global problems such as: force and security; law and military intervention; terrorism; the environment; religion explains the relationship between global politics and economics with chapters on international organisations, international poltical economy and development provides students with boxed 'revision-style' notes and case studies throughout the text and a guide to further reading and websites at the end of each chapter This is ideal reading for students onintroductory international relations courses.